A new course on Islam designed for journalists tries to minimize the impact and importance of ''jihad'' by comparing it to the number of murders in America each year. That same course claims ''right-wing activists'' tried to tie American Muslims to terrorism and doesn't mention examples of Islamic attacks on press freedom. That's the way a prominent news organization is teaching journalists in a three-hour online course. The Poynter News University, part of the Poynter Institute, launched the free course ''Covering Islam in America'' to guide the media on their coverage of Muslim communities. The George Soros-funded Social Science Research Council, which received $50,000 from the Open Society Institute ''For Initiative on HIV/AIDS and Social Transformation,'' is one of the groups behind the initiative, along with the Edward R. Murrow College of Communication at Washington State University. That fits with a theme for liberal financier Soros, who has spent more than $52 million on influencing the media. The Islamic course also links to another Soros-funded entity, the well-financed Center for American Progress. In about 30 pages of text with links to other reports and articles, journalists can go through and read about the history of Islam, Muslims in America, and how to cover stories on Islam. Besides learning basic facts about Muslims and their history, the course adds ways to put ''jihad'' into perspective, attack conservatives, and provide a list of liberal groups that can be contacted for expert advice and quotes. Course instructors Lawrence Pintak and Stephen Franklin are both former foreign correspondents. Pintak serves as dean at The Edward R. Murrow College of Communication at Washington State University, which is a partner of the project. He also has two books on journalism and Islam and defends the biased, activist network Al Jazzera English. This course is ''A project of The Poynter Institute funded by The Knight Foundation.'' Soros's Open Society Foundations have worked closely with The Knight Foundation. They partnered up to start the Investigative News Network, which received $200,000 from the Knight Foundation and $100,000 from the Open Society Foundations. The Knight Foundations President and CEO, Alberto Ibarguen, is also on the board for AOL and yet another key Soros backed group, the progressive investigative reporting start-up ProPublica. There is some useful information in the Islamic course for those journalists that did not pay attention in their history classes and are ignorant of Islamic beliefs. However, this does not excuse statements that accuse conservatives of bigotry. The reports that journalists are told to look at to uncover the ''right-wing activists'' agenda are even more telling. The first is a report from none other than the Soros-funded progressive group Center for American Progress, which received $7.3 million from the Open Society Foundations since the year 2000. 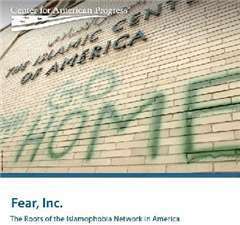 Fear, Inc.: The Roots of the Islamophobia Network in America, details charitable groups that ''spent almost $43 million financing anti-Muslim campaigns.'' One of the coauthors of the report is the Koch-hating Lee Fang, who writes for Center's left-wing blog Think Progress. Fang continuously goes after the Koch brothers for their contributions to conservatives and Tea Party support. Without describing the concerns about the encroachment of Shariah law within the U.S., the course blandly described Shariah and compared it to other religions. ''Shariah literally means the "straight path." It is Islamic law based upon the Quran, the Hadith and the Sunna, which are the habits and customs of the Prophet Muhammad. At some level, Shariah governs every aspect of Muslim life. However, just as some Catholics might ignore strictures on birth control or Jews may eat pork, Muslims also sometimes veer off "the straight path." Besides leaving out the violent nature of Shariah law, other important facts about radical Islam and journalism are omitted. No where in the course does it mention The Danish cartoonist Kurt Westergaard who published a cartoon of Muhammad sparked global riots around the globe. Protesters in 2006 ''burnt embassies and stormed several European buildings in a wave of rioting and flag-burning in which more than 100 people were killed.'' There was even an assassination attempt four years later.